Here is an interesting piece of art that serves as the center piece for a fountain in front of the Falcon Court Office Building. I looked for an artist’s name, but couldn’t find one. 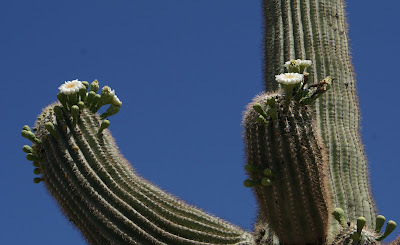 A stately saguaro laden with blooms and the moon peeking out from behind. 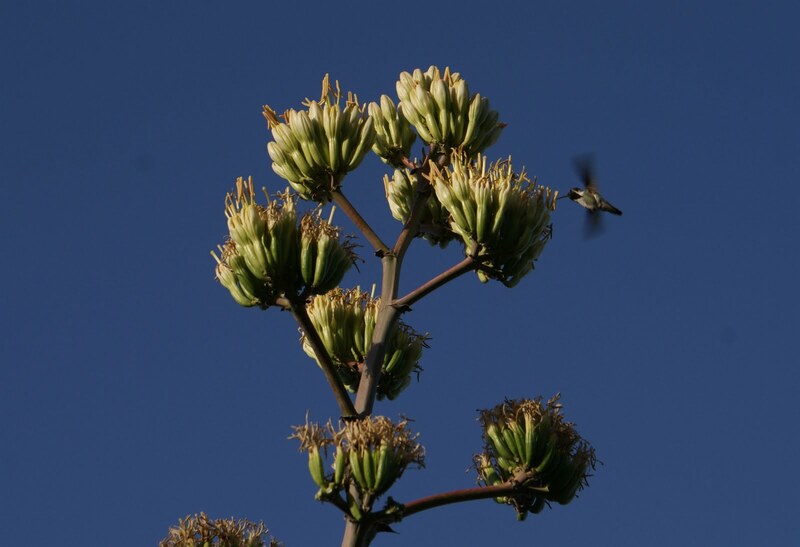 The Palo Verde trees have been in full bloom the last few weeks. When the wind blows like it did all of last weekend, it leaves a yellow carpet on the ground. These sand cast panels were originally part of a mural on the side of a retail store that was torn down years ago. The panels were preserved and placed at the Biltmore Fashion Park Shopping Center so they could continue to be enjoyed. I’m at this shopping center quite often and I just saw these Monday evening. I don’t think they’ve put them in a place prominent enough for many people to enjoy them. In fact, I doubt many people have seen them at all. The artwork dates from 1963 and the artist is John Smith. 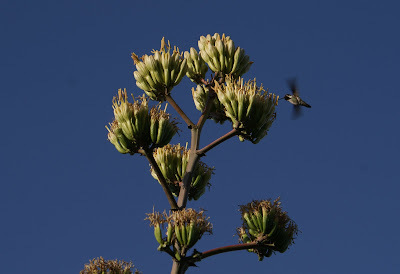 A hummingbird enjoying the blooms of the Century Plant (Agave). Here is something you don’t see very often in the city of Phoenix, a picket fence. This is from another one of the historic neighborhoods in Phoenix. This is the Woodlea Neighborhood. This would look very mid-western if it weren’t for the two palm trees lurking in the background. Here is another house from one of our many historic neighborhoods. This neighborhood is called the FQ Story Neighborhood. I love the trim around that high, slot-like window and the trim on top of the chimney. Summer is upon us and 100 degree plus heat has already arrived. I thought I’d take one last longing look at the wonderful spring beauty that greeted us such a short time ago. 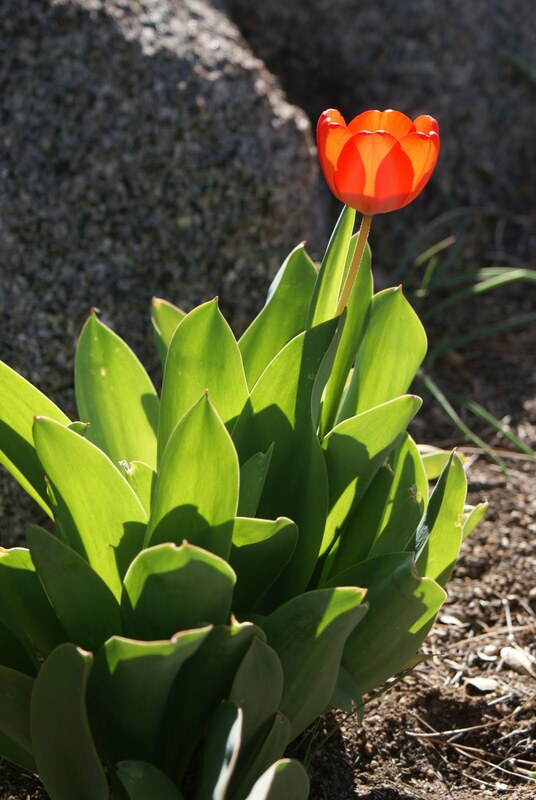 This tulip is just glowing in the Arizona sunshine. The tulips may be gone, but my photos of them linger on. 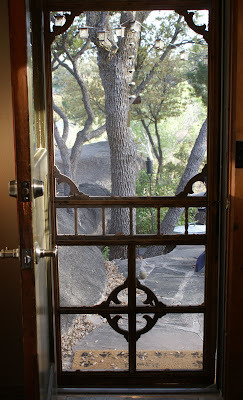 When I was growing up, I remember a screen door similar to this one in our kitchen. As a little kid, I’d watch the world go by out that door and as I grew older, I learned to come and go as I pleased. Great memories of home! 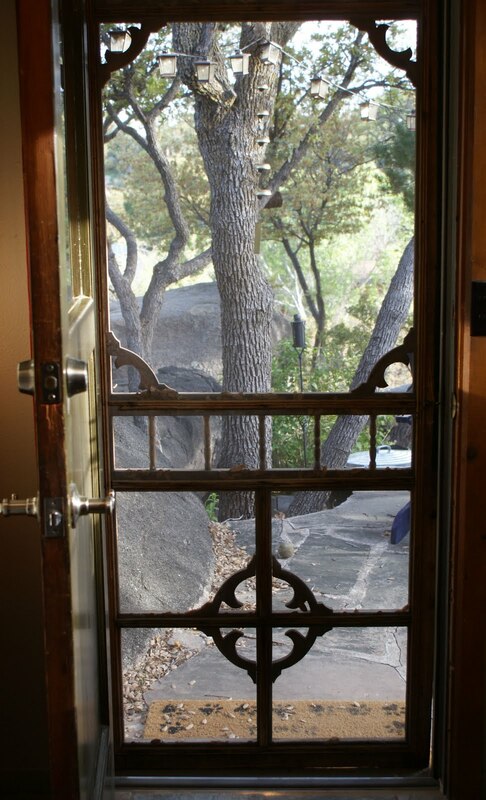 This screen door is at my friend’s cabin north west of Phoenix in the town I mentioned in yesterday’s post and where I’m spending this weekend. More great memories in the making. 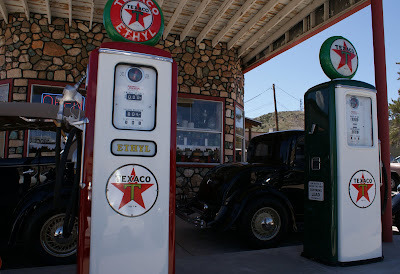 This little historic gas station is located in Yarnell Arizona, a tiny town located atop a granite hill north west of Phoenix. When special events happen in this town, they roll out the classic cars and those parked at the gas station add to the historic aura of this place. 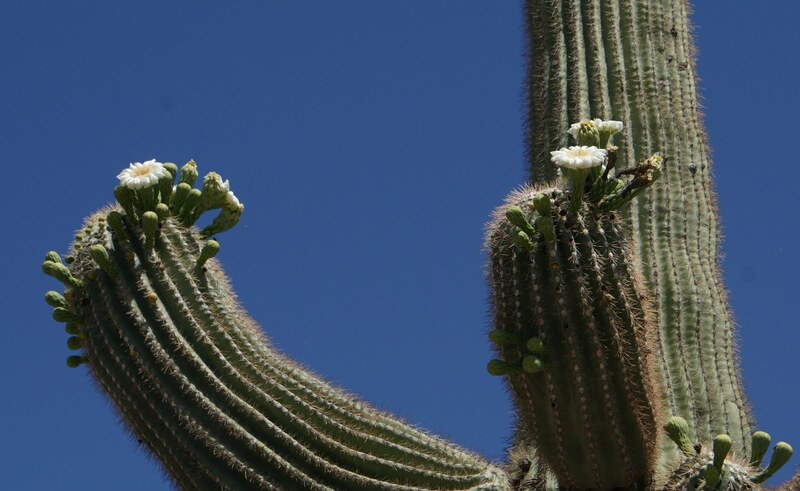 Saguaro’s are in bloom everywhere you look. Although I wasn’t his owner, I considered him part of my family. I had the distinct pleasure of caring for Jake and his sister Molly on many occasions when his real family was away from home. He was always the perfect house guest who brought joy and laughter to my quiet home. When I returned from work, I could count on Jake to greet me with some toy in his mouth as though offering me a gift to tell me how happy he was to see me. 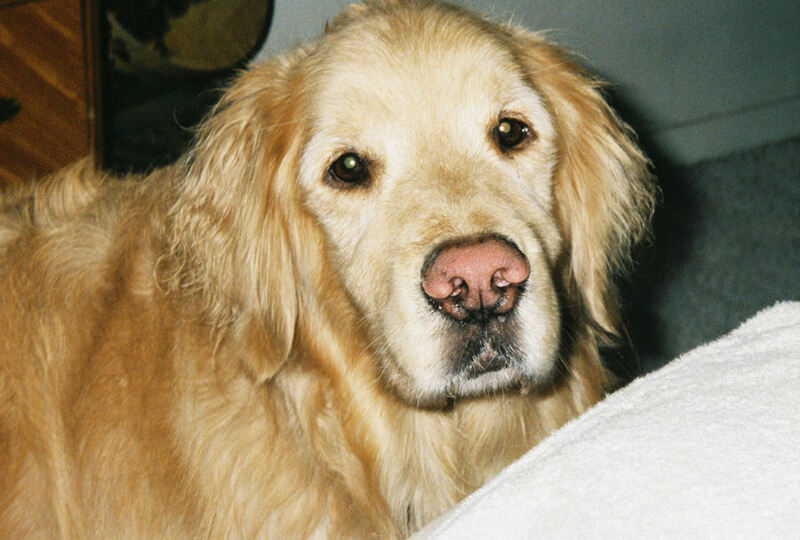 Jake was a gentle soul with dark eyes filled with canine wisdom and a heart big enough to share the love of many people. Jake my friend, you will be missed by all of the people who loved you dearly. On my drive back to Phoenix on Sunday, I passed this flower farm. It made me think of the wonderful Japanese Flower Gardens that used to be situated along baseline road in the 1970’s. It makes me wonder if some of those families moved west to this area. On Sunday I took a drive about 40 miles (64 km) west of Phoenix to the White Tank Mountains Regional Park. It is a fairly new park with its visitor’s center still under construction. I took this photo from the top of one of the drives hoping that the haze over the city wouldn’t obscure the Phoenix skyline. That was asking too much. You can just barely make out the downtown Phoenix skyline on the very right of the horizon. That large white building on the center horizon is the University of Phoenix Stadium, the home of the Arizona Cardinals Football team. The small photo is of one of the picnic areas at the park. For all of you people who live in climates where there is a lot of green, this must look a bit rugged. Remember when cars had fins? This home was obviously built with Frank Lloyd Wright in mind. It has all the characteristics of his style, grey block, curved walls, and symmetrical lines. I was out trying to photograph a true Frank Lloyd Wright home that happens to be directly across the street from this one. The trouble is, the true FLW home is behind a wall and every photograph just shows a low slung ranch house. When I turned to leave, I spotted this one and decided that it must have been influenced by its proximity to the other one. Whatever the case, I like the look of this one. At one time, the stone and gabled building in the foreground used to be one of Phoenix’s fine restaurants. Many years ago, the property was sold and then incorporated into this office complex. The only saving grace, was that they didn’t tear down the original structure, they just built the office buildings behind it and then attached the two. When I first moved to Phoenix, this was a thriving and very well known eating establishment created by Robert Gosnell. Before my time, they even had an armor-clad knight atop a white stallion serving as a parking attendant. Not a statue, a real man, clad in armor atop a horse who guided diners into the parking lot and the nearest parking spot. That would have been something to see. I’m sorry I missed it. This decorative saguaro cactus and it’s barrel cactus companion are located just outside the fence around a Phoenix home. It is well blended with the live plants that dot the property. I’ve posted a photo of Alan Houser’s Spirit of the Wind sculpture once before, but thought I’d post one more that I took last weekend. You can see that the saguaro cactus has blooms on it’s top and arms and in front of it, the ocotillo is blooming with it’s bright red spays. Then if you look behind the sculpture you will see a hint of red from the tops of the agave blooms that are scattered behind. There are even some pretty yellow wildflowers surrounding the base. There is quite a lot to see in on little photo. 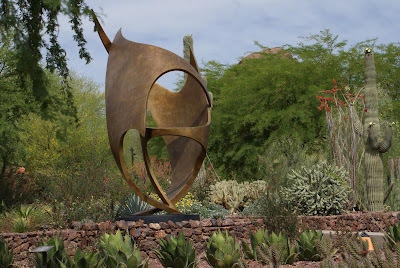 Sunday was the last day for the butterfly exhibit at the Desert Botanical Garden so I went for one last look. 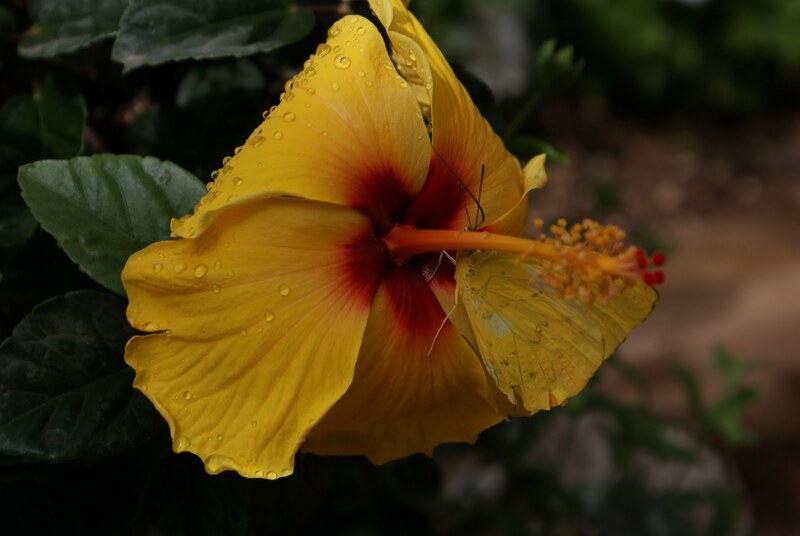 The butterflies were very active fluttering around and landing on people and plants. This Cloudless Giant Sulfur butterfly (Phoebis sennae) found a matching hibiscus flower to settle on and almost disappear into the background. You know you are in the southwest when the store shelves display a large variety of hot sauces. 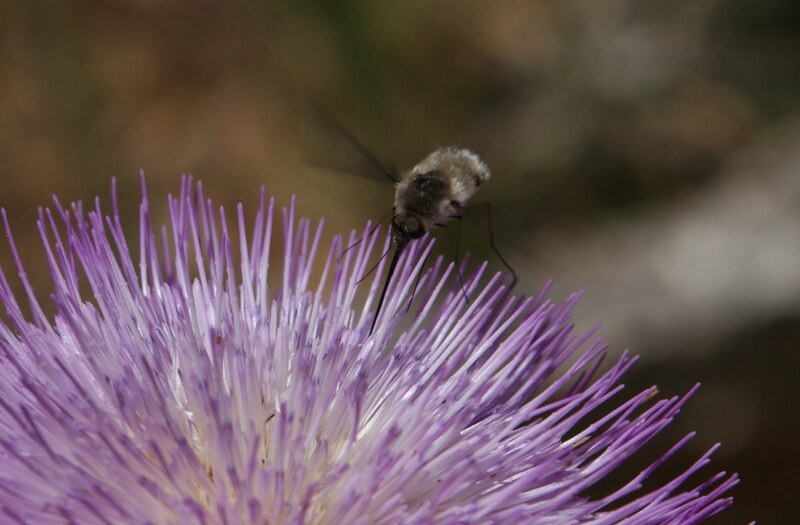 How could something so snarly produce such a beautiful flower? For Mother’s everywhere. Have a wonderful day. I spotted this tortoise through a fence in someone's backyard. I decided to get closer to take a photo and as I snapped a shot, four dogs came bounding toward the fence loudly announcing my position and warning me to stay back. The tortoise and the dogs appeared to be fast friends. This is the Phoenix headquarters for the Boy Scouts of America. This beautiful, Spanish styled building is dedicated to two Boy Scout Executives who according to the plaque on the side of the building, have a combined 80 years of service to scouting in Arizona. The honor was bestowed by the staff and volunteers of the Grand Canyon Council of the Boy Scouts of America. Isn’t this a lovely courtyard? Tomorrow I’ll show you where I found it. This horse and another just like it grace the entrance driveway for the Falcon Corporate Center. I probably would have used a falcon as the symbol for this building, but maybe that is a bit too obvious. 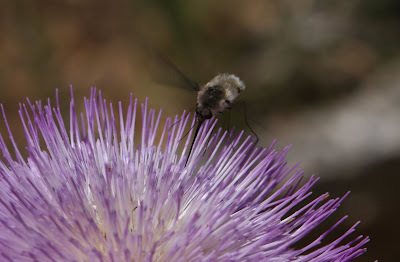 I zoomed in close to get a shot of a lovely thistle boom when this insect buzzed into the frame preparing to land. I’m not sure what it is, but that long needle nose is a little intimidating. In the market for some rustic furniture or Mexican pottery? This place might save you the trip to Mexico. 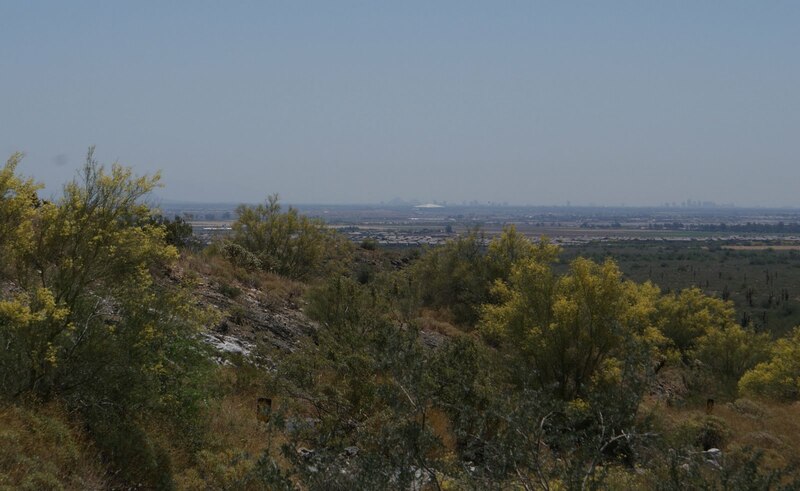 The back nine of the Arizona Biltmore golf course offers some fine views of the Phoenix skyline. The Arizona Law Enforcement Canine Memorial is located in Wesley Bolin Plaza, the park in front of the Arizona State Capitol. This memorial to canine peace officers (commonly known as K-9’s) was dedicated on April 7th, 2006. The bronze German Sheperd was sculpted by artist Jeff Carol Davenport. At the dedication ceremony, all the K-9 handlers throughout the state and their dogs were present. That must have been something to see.